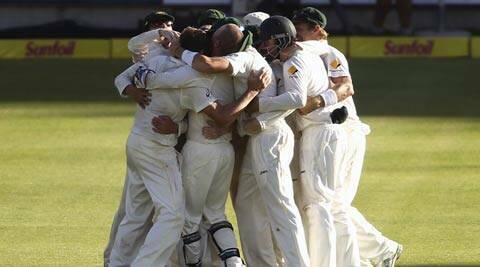 Australia’s 2-1 series triumph has seen Clarke’s team leapfrog India into second place in world Test rankings. The resounding thud of South Africa’s fall on home soil capped an intriguing season of Test cricket that has seen the establishment rocked and an ambitious Australia return to court with a swagger. Starched whites dispensed, the game now descends into a morass of short form matches before the World T20, but the impact of Australia’s epic win at Newlands on Wednesday may echo long after the Bangladesh carnival wraps up. Australia’s 2-1 series triumph, following their 5-0 whitewash of England at home, has seen Michael Clarke’s team leapfrog India into second place in the world Test rankings. For this, they also owe thanks to their gritty neighbours New Zealand, whose triple-century scoring captain Brendon McCullum helped them secure a 1-0 series win over poor tourists India. A wounded South Africa retain their spot at the pinnacle of Test cricket but captain Graeme Smith’s retirement has left the team rudderless and vulnerable. “If you go back to my era, before the rankings existed, we always felt if you beat the number one in their own backyard you took over their mantle,” former Australia captain Mark Taylor said in comments published by Fairfax Media on Friday. While lacking the trauma of England’s 5-0 loss to Australia, which saw spinner Graeme Swann retire and batsman Kevin Pietersen sacked, South Africa’s braintrust also face a period of soul-searching. Few other teams have been so defined by their leader, and Smith’s retirement after a decade in charge comes hot on the heels of the exit of Jacques Kallis, arguably the game’s greatest all-rounder, and coach Gary Kirsten. The net loss of decades of experience compounds South Africa’s more tangible problems of bedding down an opening batsman to replace the hard-bitten Smith and finding another bowling option to compensate for Kallis ahead of a two-test series against Sri Lanka slated for July. England, who have been dropped to fourth in Test rankings, have a chance to reel in third-ranked India when they host the team in July and August following two home Tests against Sri Lanka. Australia, however, will have to wait until a two-Test series away to fifth-ranked Pakistan in the United Arab Emirates in October to improve their ranking points. While Australia’s resurgence against England was largely down to their Mitchell Johnson-fired pace attack, their batting lineup shared the load in South Africa, with David Warner plundering 543 runs at an average of over 90 in the three-match series. “In Australia it was more about the bowlers bowling them out and batters probably not doing their role well enough (in) the home series but here they were outstanding,” Australia coach Darren Lehmann said in Cape Town. A tilt at South Africa’s top spot will require sustained excellence from both batsmen and in the field, he added. Much will rest on the creaking bones of a greying Australian side, with 34-year-old paceman Ryan Harris set for major knee surgery and captain Clarke’s aching back an ongoing lottery. Opening batsman Chris Rogers and wicketkeeper Brad Haddin will also be pushing 38 by the time Australia ready for next year’s Ashes series against England. Sydney: Australia’s media has acclaimed its cricket team’s epic series win over South Africa, but not the manner in which they achieved it. Their aggressive brand of cricket under coach Darren Lehmann was rebuked by sections of the media on Friday over their on-field behavior during the final Cape Town Test. “Darren Lehmann has guided the Australian cricket side to the top of the world. His next challenge is to control it,” News Ltd cricket columnist Robert Craddock said. “Australian fans like to see their side play tough cricket but social media in Australia yesterday had strong feedback from fans wanting their side to behave better.